Back in September I wasn’t seeing any improvements in my 5 km/10 km times even though after three years in the Philippines I was fully acclimatised and my mileage was up at the 70 km level per week. 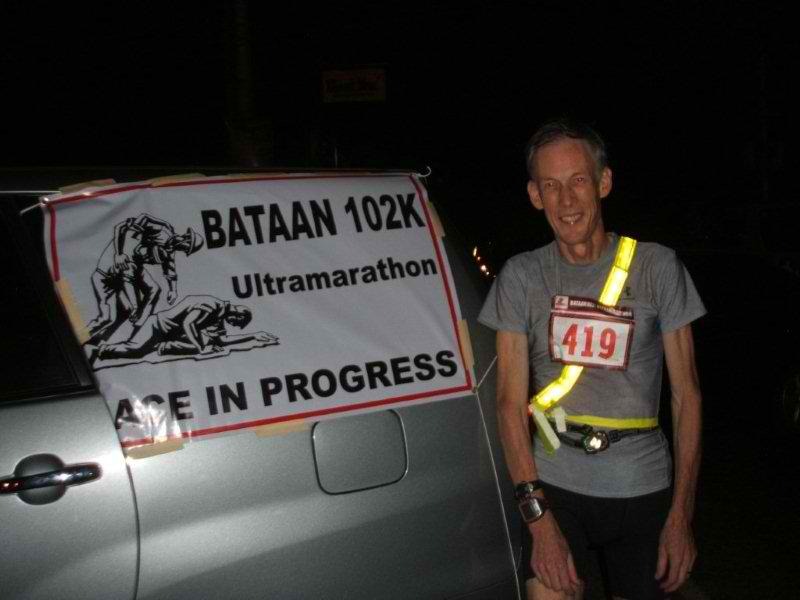 I knew I was leaving the Philippines in March and when I heard about the BDM 102 I thought that it would make a suitable climax to my running in the Philippines. I wanted to do my best I could in the race, even though it was my first ever and possibly only ultra-marathon. So I looked round for both a running coach and a nutrition coach. 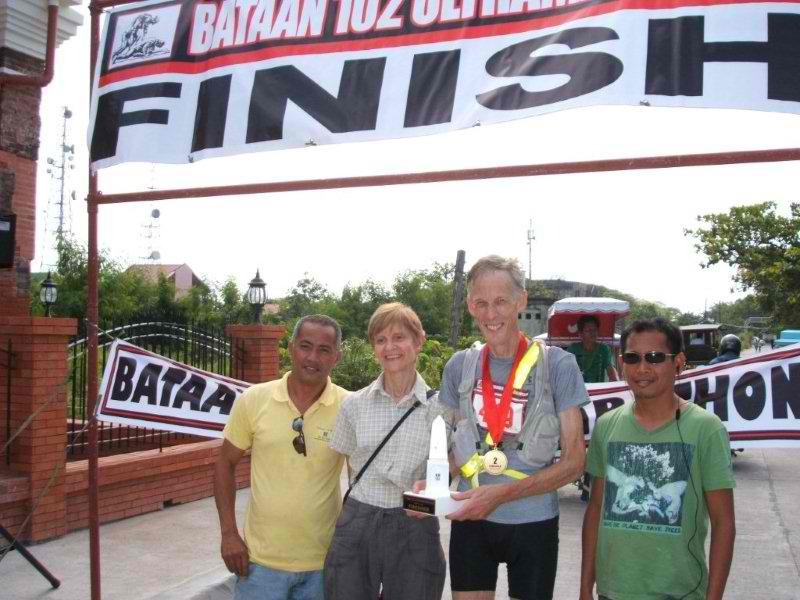 I needed coaches who knew how to train someone for top-class ultra-marathon running and in Ige Lopez I found someone who is both an experienced ultra-marathon runner and coach. He put me on a training schedule in three parts – 7 week build-up towards 100 km/week, 10 weeks of endurance/speed training which peaked at 160 km/week (including warm-up runs), and then one month tapering before the race. The training was very varied – long slow runs at weekends reaching back-to-back 75/25 km runs, moderate-paced runs up to 21 km, sometimes with hill sessions or fast intervals, aerobic-paced runs on alternate weekdays and one rest day a week. I was fortunate to avoid any injuries in training. However if I had experienced the BDM course before the race, I would have realised that I needed to do a lot more hill work (Ige did hint this to me), but work and family commitments would have got in the way. The highlight of this training was a 3 hours 20 minutes marathon in December. The lowlight of the training were forgetting to take my hydration pack on one of my trips abroad, which disrupted the nutrition plan for my 60 km training run. My nutrition coach Harvie de Baron was excited to take on the challenge of helping me with the BDM 102. He has advised good athletes and those trying to lose weight before, but not someone doing an ultra-marathon who can’t gain weight. In fact after a few weeks of additional healthy snacks (fruit, sports bars and milk) I gained 2 kilos which converted to additional muscle whilst my fat content remained very low at 5%. This can be explained by my high metabolic rate, equivalent to that of a 12 year old! The plan for the race was to get all my calories through liquid rather than food. I opted for wearing a hydration backpack and taking frequent sips of isotonic drink, with short stops every ten km for an energy gel and extra water. We slightly increased the concentration of isotonic drink to enable me to get 260 calories/hour. I could also carry a phone, torch and spare headlamp in the hydration pack and I got used to carrying all this weight on my training runs. Other key ingredients of the training were a protein recovery drink after all long runs and a weekly massage. I decided to race in compression shorts and vest, much as the triathletes do, which avoided any chafing problems. My GPS watch was essential to my training and the race itself, but I wore a second basic running watch as a backup just in case it failed me. 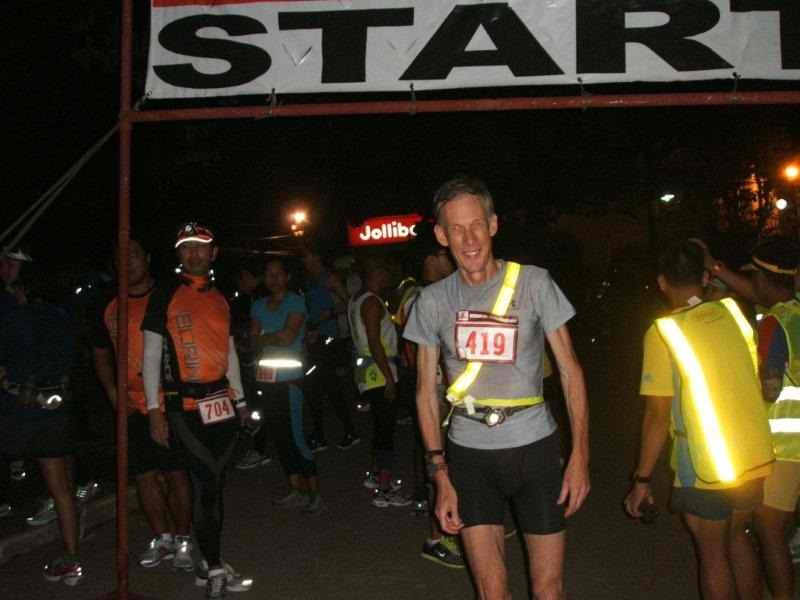 During the five and half months of ultra marathon training there wasn’t much of a life other than running and sleeping. Moreover the demands of work as well as the training meant I often didn’t get enough sleep – but not starting work until the afternoon most days allowed me to catch up with sleep after the early morning runs. The gun went off promptly at 10:15 pm. I immediately joined the leading group and was running comfortably at 4:30 mins/km pace! I knew I had to slow down but somehow I kept up my pace on the long hill and even went into the lead for a few kilometres. I arrived at my first drink refill stop after 12 km, five minutes ahead of schedule. I knew then I blown the negative split strategy and it could lead to serious problems before the end of the race. So after continuing quite fast downhill for the next ten kilometres, I eased back the pace considerably. I got a bad shock when the 22 km marker for my next drink stop wasn’t in sight after 25 km and I lost five minutes making a phone call to the support team. Jonnifer Lacanlale, the eventual winner, passed me at this point but I didn’t try to catch him. All my drink stops every ten kilometres were under three minutes – the time it took me to swap drink packs on my back, and take an energy gel plus water, giving a total of 25 minutes of stops, which is probably less than most runners, even the other fast ones. At the 42 km drink stop, I vomited due to the volume of liquid I was drinking but I was prepared for this – I just took another drink of water and set off without any delay. Running in the dark went well – it was not too hot; there was a full moon and there was a wide edge to the road so that I could easily dodge any oncoming trucks/buses that didn’t move out when approaching me. The only near-miss occurred when a bus coming fast from behind on the wrong side of the road passed within two feet of me but most likely the driver had seen me because of my reflective strips. This year there were no accidents in the race. After 52 km I slowed down to below 6 mins/km and thereafter the pace was closer to 6:30 mins/km. Each ten kilometres seemed never-ending because I could see from my watch how slowly I was running, but I kept focussed. I had been due to change shoes and socks after 52 or 62 km, but I abandoned this idea since I didn’t feel any problems with my feet, which turned out well since the third place runner was only five minutes behind me at the finish. After the half-way point, I was followed closely by another runner. However at 82 kilometres he only walked on whilst I changed drink packs and then when I passed him again he dropped out of sight. I heard afterwards that he finished in 15 hours which meant that he spent more than 6 hours on those last 15 kilometres which is a horrendous consequence of his going too fast at the beginning. When dawn came I had reached 75 km, but I didn’t notice the heat until the last 10 km when I was running the very long straight road from Guagua to the finish. At this point I couldn’t see anyone behind me and my final 10 km was done comfortably at 7:06 mins/km pace. I crossed the finish line at precisely 9 am in a time of 10:44:56, which is an average running pace of 6:02 mins/km, and second place! So the endurance training was a success but my pacing was a failure. It was clear from my times in training that I could hope to run at 5:30 mins/km pace for the BDM, which when stops are added, would be a net 5:50 mins/km pace – within the course record. I was well prepared for this, including many moderate pace runs at 4:30-5:00 mins/km and good practice at running negative splits. Such times on largely flat roads probably gave me false hopes and the over-confidence in my speed that tapering brings plus the effect of running steeply uphill until 10 km was too much and I failed to follow my own race plan. My overall liquid consumption was 150 ml/hour less than planned which is understandable in a night-time run. This meant I only took in 220 calories/hour on average, which probably contributed to my slowing down in the second half of the race. I didn’t make this risk clear to my support crew and so I never used the contingency plan of taking an energy gel every five kilometres instead of every ten to compensate. Even if I hadn’t run too quickly at the beginning and everything else had gone according to plan, I am not sure I could have matched Jonnifer’s time without doing as much hill training as he did. I very much appreciated the efforts of my support crew: my wife, our driver and one extra driver. They ensured that I never missed them at a stop, checked I was crossing the road safely every time, re-filled my hydration packs in between stops, kept the stops to a minimum time and all this meant that they didn’t get any sleep either. Why did I do it? Were the long hours of training worthwhile? What’s next? I run because it is easy to do and I am built for it, even though having the right running gear makes it an expensive sport. 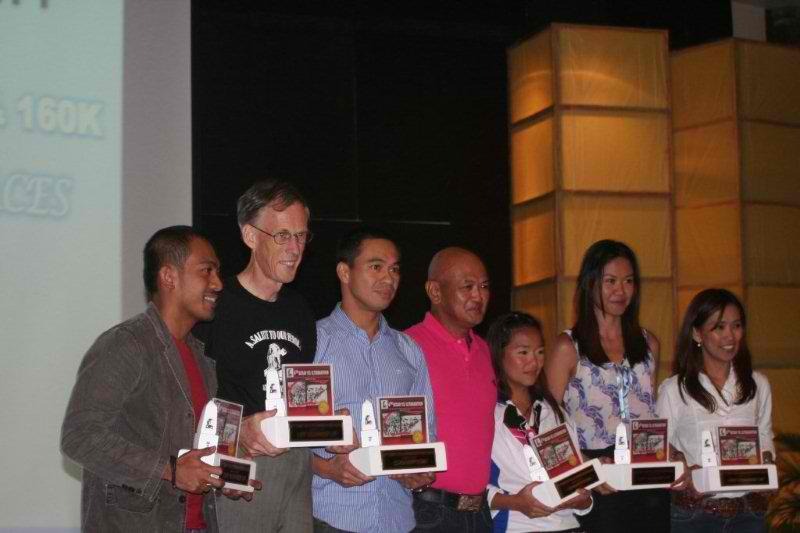 I like the competitive nature of races and the thought of winning is a great spur for me to action. I like the health benefits it brings – very high fitness level even at the age of 60, with not a day off work through illness in the last 10 years. With no weight problems I can eat and drink what I like within reason. Running also gives me extra energy for work which brings its own rewards as well. So I see myself continuing to run for many years yet, competing against the world’s best runners in my age group. 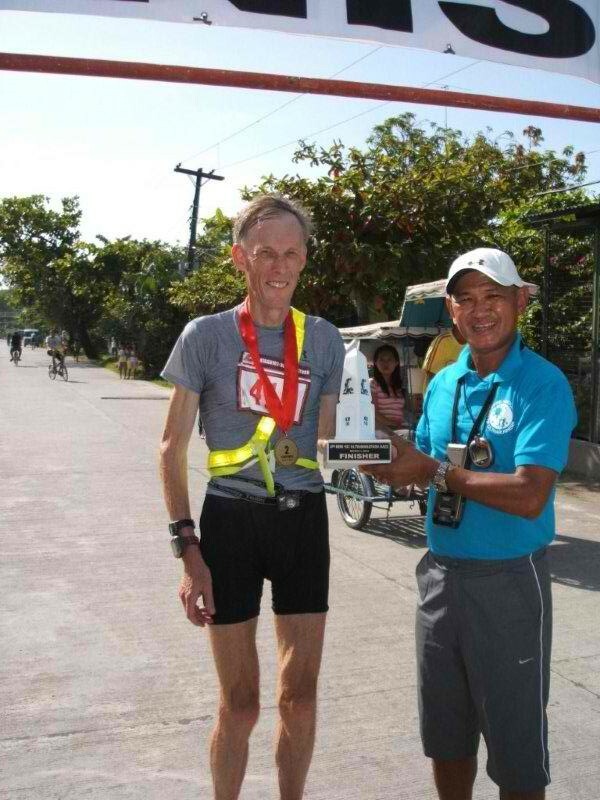 The change from middle-distance running on the track in England to an ultra-marathon in the Philippines has been very enjoyable and I intend to vary my competitive programme going forward with a different focus some years to others. I hope this account inspires more people of any age to change their lifestyle to include exercise and good diet and others to extend their running beyond the fun-run level right up to the challenge of doing a fast ultra-marathon.